Apple is making more money than ever, but it still doesn't seem to be enough to keep everyone happy. Not with conspiracy theories swirling around Apple's secret slowdown of older iPhones while a cloud of uncertainty looms over its high-priced iPhone X. It's a reality check for a company accustomed to an unflinchingly loyal customer base. Apple expected buyers to embrace the iPhone X as a revolutionary device worth its $1,000 price, but it's still not clear how many people are willing to ante up, especially with other recently released models selling for $200 to $300 less. The first clues about consumers' interest in the iPhone X emerged Thursday with the release of Apple's fiscal first-quarter earnings report. That period covered the final three months of last year, including the early November debut of the iPhone X.
Apple sold 77.3 million iPhones in the quarter, about 1 million fewer than at the same time in the previous year, which included an additional week because of quirk in the calendar. Despite the smaller window of time, analysts had predicted Apple would sell 80 million iPhones in the past quarter, according to FactSet. What's more, consumers disillusioned with the slowdown of their devices may be even less inclined to upgrade in the months ahead. Apple attributed the slowdown to its effort to prevent unexpected crashes caused by aging batteries, and it's now offering to replace those batteries for just $29. That $50 discount is available as part of Apple's apology for not being more forthcoming about what it did. Apple CEO Tim Cook told a different story, describing it as its top-selling model in every week since its release in early November. "We feel fantastic about the results," Cook said in a conference call with analysts. "The most important thing for us isn't really the numbers. It's customer satisfaction and customer satisfaction is literally off the charts on iPhone X." 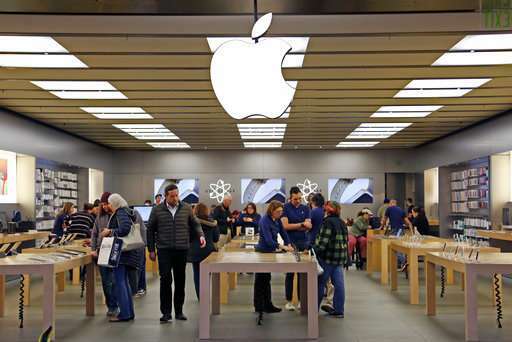 But Apple's revenue forecast for the current quarter fell below analysts' already diminished expectations, fueling fears that early appetite for the iPhone X has quickly faded. Those concerns are the primary reason Apple's stock had fallen about 7 percent since hitting an all-time high two weeks ago. The shares recovered some of those recent losses after the quarterly numbers came out, gaining $5.62 to $173.40 in after-market trading. The iPhone X is unlike any other iPhone in the decade-long history of Apple's best-selling product line. It features a brighter screen that spans the device from edge to edge, and boasts facial recognition technology for unlocking the device and other features. Although those changes appear to be winning over consumers who flock to the latest in technology, facial recognition technology may be turning off potential buyers more comfortable with the familiar home button on all other iPhones, O'Donnell said. Apple doesn't break down iPhone sales by model, instead reporting only the total number all phones sold. That practice forces analysts to do a bit of guesswork based on the limited information that Apple provides. One inescapable conclusion is that the higher prices of the iPhone X and the other two other new models, the iPhone 8 and iPhone 8 Plus, are propelling Apple's earnings and sales to record levels. 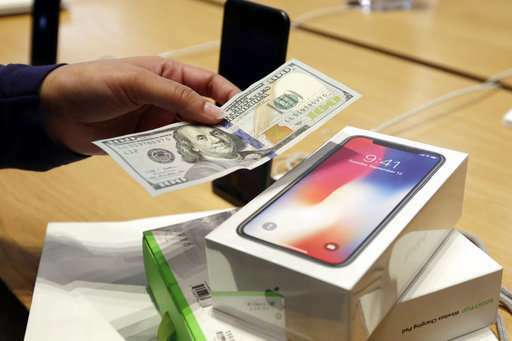 Apple sold its iPhones for an average of $796 during the past quarter, a roughly $100 increase from the previous year. That helped lift Apple's profit 12 percent from the previous year to $20.1 billion while revenue surged 13 percent to $88.3 billion. More telling than any of the quarterly numbers may be the lack of a wait to get an iPhone X now. Most analysts thought intense demand and a shortage of components meant Apple wouldn't be able to fill all orders until this spring. But the iPhone X is currently available, meaning that either Apple solved the production issues earlier than anticipated—or consumer demand is waning.